With a colorful camouflage design, the backpack by Guard Dog Security is one of dozens of bulletproof school supplies currently available on the market. After February’s school shooting in Parkland, Florida, brought the fervor over school violence to the top of the national conversation, companies that typically sell products for soldiers and police officers increasingly are seeing new sales opportunities in America’s classrooms. Manufacturers and distributors of bulletproof school supplies — like whiteboards, backpacks, and “emergency response shields” — say business is booming since the Valentine’s Day massacre, with some boasting increased sales of as much as 1,000 percent. Like much of the current school security debate, the claims about the products’ sales — as well as their utility — are a mix of substance and marketing. A security company commissioned a parent survey that found near unanimous support for ballistic equipment in schools, and that 1 in 5 parents had already purchased bulletproof supplies like backpacks for their children. But some school safety experts are skeptical of claims about the popularity of such items, and few companies were willing to share sales figures with The 74. Among companies noting an uptick in post-Parkland sales is Hardwire, a Maryland-based armor manufacturer that’s been supplying equipment to the military for about two decades. The company expanded into school security after the 2007 mass shooting at Virginia Tech, said founder and CEO George Tunis. 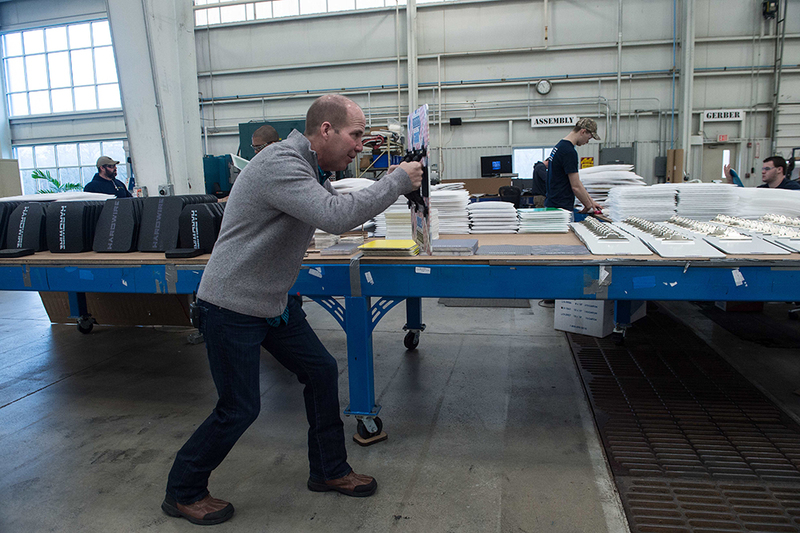 Now, Hardwire offers bulletproof whiteboards, an “emergency response shield” designed to look like a fire extinguisher, and backpack inserts that he boasted are lighter than a copy of People magazine. Although the company declined to provide sales figures, Tunis said his company has experienced a steady increase in sales since the Parkland shooting, but he added that student-centered products remain the smallest segment of Hardwire’s business. The owners of multiple manufacturers and retailers, including Guard Dog Security and TuffyPacks, said they observed a post-Parkland sales surge but declined to provide specific sales figures. Across manufactures, most bulletproof backpacks cost a few hundred dollars, while backpack inserts — shields people can install themselves — are typically more affordable. Mark Sontag owns the ballistic bag company Diamondback Armor and the retail site Kincorner. Though it’s only been selling the items since August 2017, Kincorner bills itself as the “industry leader,” and Sontag said in an email that his site has “consistently been the #1 dealer for Guard Dog Security and Diamondback Armor.” Since August 2017, he said, he has sold about 1,200 backpacks, with about 900 coming after the Parkland shooting. Sales also spiked after the school shooting in May in Santa Fe, Texas, he said. Another retailer, Bulletproof Zone, jumped into the business at the end of last year. In 2018, the company sold 500 bulletproof backpacks and 1,700 backpack inserts, with a majority of sales coming in mid-February, after the shooting in Parkland, and as students geared up for the new school year, owner and co-founder Kevin Lim said. One industry-funded parent survey implies that millions of students are walking around schools with bulletproof school supplies. One in five parents said they have purchased “bulletproof gear or items” for their children, such as a backpack or clipboard, according to the survey, commissioned by Hardwire. Conducted by the market research firm Wakefield Research and administered online to 1,000 parents of K-12 children, the survey found 95 percent of respondents saying they’d support their school in purchasing bulletproof classroom equipment. Additionally, about three-quarters of survey respondents are concerned about the possibility of a shooting happening at their child’s school this year. That finding seem to far outpace results in a recent PDK International poll, which found that 1 in 3 parents fear for their child’s safety at school. Beyond skepticism around the popularity of bulletproof backpacks, Trump, the school safety consultant, questioned their effectiveness. “If a kid needs a bulletproof backpack, wouldn’t they need a bulletproof front pack, a bulletproof helmet, and a Captain America shield to go along with it?” asked Trump, who has no relation to the president. Although companies across the security industry — from purveyors of bulletproof backpacks to those selling surveillance cameras — have doubled down on marketing efforts post-Parkland, school shootings are statistically rare and campuses have actually become safer in recent years, according to recent National Center for Education Statistics data. And there is little academic research to show whether the bevy of school security technology is effective at preventing attacks. 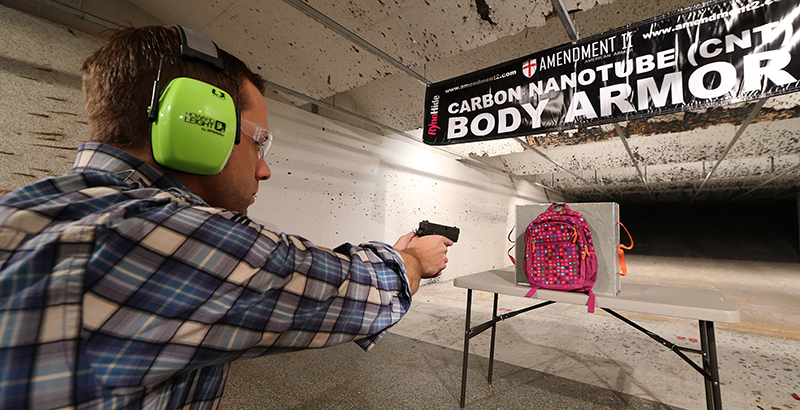 Tunis of Hardwire defended his products from critics who’ve characterized bulletproof school supplies as impractical, noting that ballistic protection is just one piece of the school safety equation. Some school leaders see value in bulletproof materials as an added layer of security. In March, Hardwire donated several dozen emergency response shields to Worcester County Public Schools in Maryland, and education officials there say they were glad to install the products. The bulk of the shields were placed inside Pocomoke High School, closely mimicking what codes require for fire extinguishers, said Annette Wallace, the district’s chief operating officer. Wallace, who previously served as the high school’s principal, said the shields provided a sense of security. Wallace couldn’t say, however, whether the district would have jumped to purchase the shields had it not received them as a donation. “A school system’s ability to come up with money to provide defenses against these kinds of evil that we’re talking about — we don’t have extra money in the school system, just to be absolutely honest with you,” she said. 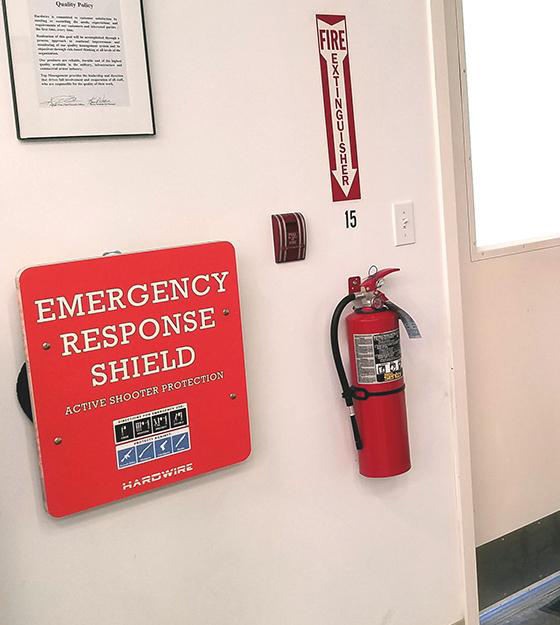 Although a majority of those purchasing Hardwire’s school safety equipment are parents, Tunis said he hopes districts — and even states — implement the emergency response shields like they do fire extinguishers. Since 2013, Hardwire and other donors have gifted several hundred thousand dollars’ worth of the ballistic shields to schools across the country, including in Worcester County, where the company is located. The ballistic devices haven’t been used to save any lives, and Tunis said he hopes it never comes to that.